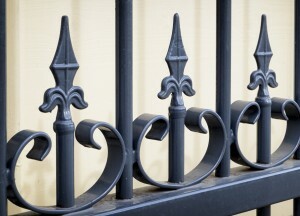 Is a wrought iron fence right for your yard? Wrought iron fences can be gorgeous on the right property. Ah, wrought iron fences. They’re so old world, aren’t they? They have a certain Southern Gothic charm to them that makes them the perfect addition to many yards and homes, but how do you know if you’re one of them? Today we’ll be going over some of the cool things about wrought iron fences, so settle in and get ready for a sweet read. Are you ready to learn more? Here we go! What can wrought iron do for you? A wrought iron fence, as we’ve mentioned has a lovely aesthetic to it. If you have a Victorian style home, then wrought iron might be the perfect addition to your property. More modern homes could work with a wrought iron fence, but tread carefully. This is not a good fit for homes with a more bucolic feel to them. However, homes with lots of ivy growth might make for a nice backdrop for a wrought iron fence. You have to look at your property and envision the fence. If the fence fits, buy it. Choosing the right style for your wrought iron fence is easy when you plan. When you spend a little time planning properly, making the call on which fencing material is right for your home is a snap. They come in four colors: Black, white, bronze, and dark green. So, if your property has a particular look, then you can match your fence to your color palette. You can also choose how ornate you want your new fence to be. Wrought iron can be very ornamental, but this may not be right for your home. Just assess and plan accordingly. You should also make sure to create a clear budget before any major building project so that your contractor can help you get the fence of your dreams in a timely fashion. Looking to invest in a wrought iron fence? This entry was posted on Monday, June 22nd, 2015 at 12:48 am. Both comments and pings are currently closed.